On Jan. 21, 2009, BASF, the world's leading chemical company, presented three industry leading homebuilders with the first annual BASF Builders' Challenge Award. The awards ceremony, conducted with the U.S. Department of Energy (DOE), highlighted the extraordinary progress made by three builders in constructing homes that meet the DOE's Builders Challenge goal of creating homes that achieve 70 or better on the EnergySmart Home Scale (E-Scale). Introduced by the DOE in 2008, the E-Scale allows homebuyers to see how the energy efficiency of a particular home compares to the DOE energy efficiency goal and other homes. 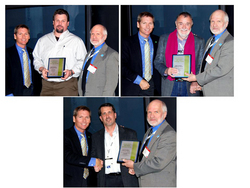 The awards ceremony, which took place at the International Builders' Show (IBS) in Las Vegas, Nevada, brought together more than 65 construction professionals that included builders, manufacturing partners and representatives from the DOE and BASF, all of whom are committed to promoting Net-Zero energy home building. John Wesley Miller, President, John Wesley Miller Companies, for building the first Net-Zero home completed in the Builders Challenge program. Tom Wade, President, Artistic Homes, for meeting the Builders Challenge goal of providing cost-effective Net-Zero Energy homebuilding strategies. Nat Hodgson, Vice President, Construction, Pulte del Webb, for building the highest number of homes to qualify under the Builders Challenge in 2008. "Creating added value for our customers and society is a key driver for all of us at BASF," said Armstrong. "For residential construction, that translates into a passion to enable everyone someday to live in a Net-Zero Energy home. "Although chemistry is a key contributor to improving the energy efficiency of our homes and workplaces, we need events like this one, where like-minded professionals form a community to make it a reality. In that spirit, we honor these builders whose passion inspires others to create a Net-Zero energy future." The DOE Builders Challenge, launched at the 2008 IBS, is a voluntary, energy-savings program to encourage the nation's homebuilding industry professionals to create 220,000 high-performance energy-efficient homes by 2012. DOE's goal is that homeowners will be able to purchase cost-effective Net-Zero Energy Homes anywhere in the United States by 2030. The 1.3 million homes to be built to the challenge standard between now and 2030 are expected to reduce carbon emissions equivalent to taking 606,000 cars off the road annually. For images of the awards event, please visit, http://www.highperformancecommunity.com/vpr. To learn more about the USDOE EnergySmart Home Scale (E-Scale), please visit, http://www1.eere.energy.gov/buildings/challenge/energysmart.html. BASF Corporation, headquartered in Florham Park, New Jersey, is the North American affiliate of BASF SE, Ludwigshafen, Germany. BASF has more than 15,000 employees in North America, and had sales of approximately $16.4 billion in 2007. For more information about BASF's North American operations, or to sign up to receive news releases by e-mail, visit http://www.basf.com/usa. BASF is the world's leading chemical company: The Chemical Company. Its portfolio ranges from oil and gas to chemicals, plastics, performance products, agricultural products and fine chemicals. As a reliable partner, BASF helps its customers in virtually all industries to be more successful. With its high-value products and intelligent solutions, BASF plays an important role in finding answers to global challenges, such as climate protection, energy efficiency, nutrition and mobility. BASF has more than 95,000 employees and posted sales of almost €58 billion in 2007. BASF shares are traded on the stock exchanges in Frankfurt (BAS), London (BFA) and Zurich (AN). Further information on BASF is available on the Internet at http://www.basf.com.